Reading, PA—On Tuesday, October 24, Berks Encore is expecting more than 4,000 adults over the age of 50 to attend its 17th annual Senior Expo at the DoubleTree by Hilton Hotel, 701 Penn Street, Reading. Where else can you speak with more than 140 vendors, enroll in Medicare, learn to eat well on a budget, get many different health screenings done, and enjoy first-class entertainment? The event is free and open to the public. The Berks Encore Senior Expo will be open from 9 a.m. – 3 p.m. Because parking at the DoubleTree Hotel is strictly limited to vendors and those with handicapped placards, there is alternative parking at the First Energy Stadium, home of the Reading Fightin Phils (1900 Centre Ave, Reading, PA 19605). Wheelchairs will be available in DoubleTree lobby, courtesy of Baird Respiratory & Medical Equipment. 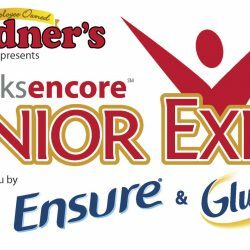 Parking for the 2017 Berks Encore Senior Expo brought to you by Ensure, Glucerna, and Redner’s Warehouse Markets will be at First Energy Stadium, home of the Reading Fightin Phils (1900 Centre Ave, Reading, PA 19605). There will be continuous shuttle bus service running between the First Energy stadium lot and the DoubleTree Hotel throughout the day. Unless you have a handicapped placard, please do not attempt to park at the DoubleTree Hotel. Shuttle service is sponsored by Sight & Sound Theatres. Help combat senior hunger during Berks Encore’s Senior Expo and Share the Love! For many seniors nationwide and in our own community, Meals on Wheels can be the difference between living independently in their own homes to relocating to a nursing facility. Your nonperishable donation will help augment Meals on Wheels deliveries as well as build up food pantries at select Berks Encore centers. Donations will be accepted throughout the day on October 24 at the at the First Energy Stadium, home of the Reading Fightin Phils (1900 Centre Ave, Reading, PA 19605). Donations can also be dropped off at The DoubleTree Hotel on the day of the event. Title sponsors Ensure and Glucerna will provide product samples and tastings. In addition, the Berks County District Attorney’s Office will be collecting expired and unused prescription medication. This Prescription Drug Take-Back is focused on alleviating the health and safety concerns from the diversion and abuse of prescription drugs. Redner’s Warehouse Markets Corporate Dietitian, Meredith McGrath, will be presenting “Cook More! …with less!” Join Meredith as she walks you through planning, purchasing and preparing for everyday cooking. You will learn how to get full, satisfied, and nourished with less time, less money, and a lot less sugar, calories and fat. The presentations will be held at 9:15 a.m. and 12:30 p.m. in the amphitheater. In response to the overwhelming success of the Medicare sessions of the past four years, Berks Encore’s staff will facilitate additional information sessions and will be available to answer questions. Dot Hartman, Berks Encore vice president of community-based aging services, will present Medicare Changes to 2018 throughout the day. The presentations are sponsored by Marrella Financial Group. In addition, APPRISE counselors will be available to assist with Medicare Open Enrollment. Counselors will be available in the second floor conference rooms. If you would like to meet with a counselor, please bring along your Medicare card and list of medications. There is no fee for this service. Berks Encore welcomes back Jeff Krick, Elvis Tribute Artist, for two shows in the Amphitheater. Jeff Krick is known as the number one Elvis tribute artist in the country. Krick has been performing professionally since 1990, having entertained in more than 15 states and raised money for numerous charitable events. He has also performed with Elvis’s original backup vocal group, The Stamps Quartet. These performances are sponsored by White Star Tours. Looking for lunch? This year Berks Encore has partnered with Cheers Restaurant at the DoubleTree to bring Expo visitors Lunch & Learn specials. During any program taking place from 11 a.m. to 1 p.m., guests can purchase a special bagged lunch for just $5 and enjoy their meal during a program. DoubleTree staff will be taking orders outside the Willow and Birch ballrooms beginning at 10:30 a.m.
Live radio broadcasts by WEEU personalities Mike Keller and Mike Faust will include special guests. Mike Keller & Mike Faust will be interviewing a variety of Senior Expo vendors and Berks Encore staff to share additional reasons why you should make the trip to the event. Special programs will be held throughout the day in the amphitheater and Willow and Birch ballrooms. All Medicare presentations will take place in the second floor conference rooms. Tower Health will be holding a health fair in the Birch Ball room. This health fair will feature over 20 vendors providing a number of different health screenings for participants.At 9:15 & 12:30: 7 TIPS FOR EATING WELL AND SAVING MONEY! Join Redner’s Registered Dietitian, Meredith McGrath, as she demonstrates how to use pulses, along with a wide variety of fruits & vegetables, whole grains, low-fat dairy, lean meats, nuts, seeds and helpful oils to make for a well-rounded diet. Presentation in the Amphitheater.At 10:45 “Protesting your Family” Medication management presented by Council of Chemical Abuse in the Willow BallroomAt 11:15 p.m., the Berks County Sheriff’s Department will host a K-9 team meet and greet in the Amphitheater. This presentation is sponsored by Gallen Insurance. At 12:00 p.m., LUNCH WITH LUCILLE –by Annarose Ingarra-Milch. An inspiring author whose message of how to live positively and powerfully as we age is brought to life with entertaining and uplifting stories. In the Willow Ballroom. Sponsored by Columbia Cottage of Wyomissing.At 1:15 p.m., Join UPMC as they help you to “Manage Caregiver Stress” in the Willow Ballroom.